Apparently these have been spotted in the US but no one sent us a message about it. Until now of course, when fellow Seibertronian Decepticon Finishline told us that he found both battle Masters WFC-S16 Pteraxadon and WFC-S17 Aimless at US retail. We know many others have found them, but some may not know they are out there, hence this post. That still leaves the wave 2 Micro Masters unaccounted for so let us know if you find them! I found them both at a Super Target in Lincoln Nebraska. The sightings page has a lot of other listings as well. So it's been seen elsewhere, as well. 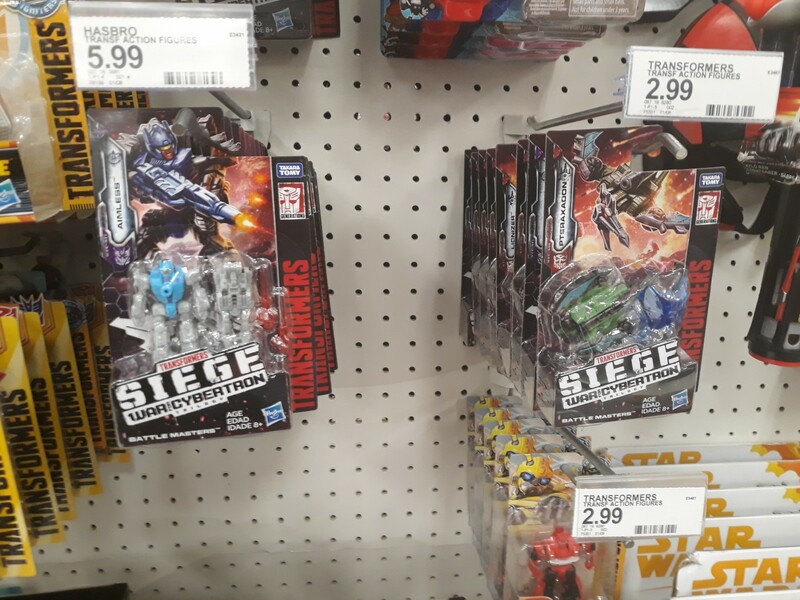 I have some sightings of Siege Starscream, Battle Masters wave 2, SS BB Optimus and Rampage, and Speed Series Cliffjumper. Found these at a Target in Brooklyn, New York. Oh crud I didn’t know these hadn’t been sighted yet. I found them last weekend in Iowa! Again, I attribute it to Aimless not really standing out, especially next to Blowpipe. I had to spend a good minute or so looking at them both to remember which one I had, and which one I didn't . But Pteraxadon certainly stands out, too bad I didn't see him. I'll have to keep an eye out for the Battle Masters. Wave 2 finally arrived in my part of Texas. Hopefully Pteraxadon is not too far behind. I finally managed to get a Leader Shockwave today and it's a pretty good figure; a great design, nice and poseable, easy to transform, and the accessories are a lot of fun. It's a shame he is so small though, even combined with all of his extra parts he's shorter than the average Voyager toy. I can't help but feel slightly ripped off, but I am still satisfied with Shockwave. As for other toys in this line, Shockwave is really the only one I want, but if I hear good things about Omega Supreme once it's out I'll try to muster up the cash for it. Munkky wrote: I finally managed to get a Leader Shockwave today and it's a pretty good figure; a great design, nice and poseable, easy to transform, and the accessories are a lot of fun. It's a shame he is so small though, even combined with all of his extra parts he's shorter than the average Voyager toy. I can't help but feel slightly ripped off, but I am still satisfied with Shockwave. I agree with you. Shockwave is nice, but his leader pricing is the total opposite. Especially when you compare him with ultra magnus(7 armor pieces and 5 weapon pieces vs 5 armor pieces). You shouldn’t feel like you got slightly ripped off, shockwave is a rip-off at MSRP. Considering shockwave is getting repacked with the galaxy upgrade Optimus later, I bet shockwave will go on sale in the near future. AlvinC wrote: Considering shockwave is getting repacked with the galaxy upgrade Optimus later, I bet shockwave will go on sale in the near future. He is? Where did this get announced? They were found in the same case in stores. Oh, I misunderstood and thought they were being rereleased in a two-pack. william-james88 wrote: Whats the running change? Yeah, I need to know too, this is intriguing since my figure looks the same as everyone else's. Is it the neck flap? Mine is still tight like new, so that doesn't bother me one bit. P.S., does anyone have a problem getting the front section of Siege Megatron's tank mode into the notches up front? It's not the actual tabbing that's the issue, but it's getting that part between the tank treads. There is almost no clearance, and requires me bending the plastic a little to otherwise do so, and I'm worried that I'll break it. Smallest Price Point -Prime Masters (8) vs Battle Masters (7). The general USD retail for all 8 PM would be about $42.92 before tax (The last wave of three experienced a one-dollar price increase). For all seven BM's, assuming no additional Price increases would be about $41.93. Less than a $1 difference, despite Siege having one less figure. However, when one looks objectively at the 8 PM's released, and the seven BM's planned on release, objectively...which do you think took more time to develop. The fronts of all the PM Shells are unique, but many of the PM themselves share the same mold. Three of the BM for general retail are unique, while the four humanoid ones share a lot, so it is too close for me to call. For this category, I would say both lines are about even. For the Next Price Point, we have Legends (9) vs Micromasters (7). The general USD retail for all nine Legends would be about $89.91 before tax. For all Seven Micromaster Packs it would be $69.93. Now as far as the uniqueness of PotP Legends go, only five of the eight are completely new. Two others are remolds, one from a previous line, and one other a re-release from a line 3 years prior. Conversely, the Micro Masters consist of all completely new molds. One could argue that the complete mass of two Micromasters is not equal to one legends class figure, and I do consider those, however I have to give the advantage here to Siege. Moving on, we come to, what arguably may be the most exciting release of every line, the Deluxe Size figures. PotP (13) vs Siege (14). The general USD retail for all 13 PotP deluxe would be about $220.87, whereas 14 Siege would be about $279.86. Quite a price difference for just one additional figure. However, this is where it gets somewhat tough. There is obviously a lot of parts sharing with PotP, and less so with Siege, however Siege has several straight up recolors, and one reuse from the previous series. The Price increase of Siege really wants me to give the edge to PotP, but I’ll give Siege the advantage woith the caveat’ that there is at least one additional figure in this size class coming out that hasn’t been revealed yet, So I guess will give this one to Siege*, for now. The next category we have is Voyager Class. PotP (5) vs Siege (6). The general USD retail for all 5 PotP Voyagers would be about $149.95, for all 6 Siege it would be $179.70. This one is not hard to judge. While there have been some complaints about QC issues with Siege Voyagers, the fact that 5 of 6 are completely unique by far is superior to PotP which had arguably only 2 new unique molds, and others that either shared engineering, or were repaints from previous lines. Siege takes this category easily. Finally, we come to Leader Class. PotP (4) vs Siege (3). The general USD retail for all four PotP Leaders would be about $199.96, for Siege it would be $149.97. Now this one truly is interesting, since Price is not a factor, and in both lines, we have three unique molds. However, the gimmick with PotP was evolution, one figure growing into another. As to how well this was executed, most seem to like Optimus and Rodimus while Primal seemed to be divisive among fans. With Siege however, of the two out, Ultra Magnus seems to be universally lauded, while Shockwave is split. Opinions about the forthcoming “Galaxy” Prime are also split. However, fans assertion that Shockwave & even Ultra Magnus were just the realization of pre-planned *Power of the Primes* designs seems to have some merit. It is nice to see these come out, but in a line where evolving to the next form really is not the theme, gets points taken away. I give PotP the win for Leaders. Therefore, you may be wondering, am I forgetting the Commander Class Jetfire? Certainly not. However since this is unique to Siege, I did not think it would be fair to include. Additionally Titan Predaking vs Titan Omega Supreme…While it appears fan opinion overall is favoring Omega Supreme, even though he isn’t even out yet, I figured it would not be fair to include Titans either, since in many areas, they are not available in general retail, but have to be ordered online. Still having said all that, Siege seems to be an overall, better-developed line than PotP. Keep in mind this is coming from a fan of combiners, and someone who spent much more money on PotP than plan to spend on Siege. Still I have to recognize the overall improvement, and hope that this will continue into the next two phases of the War for Cybertron line. As a fan of combiners, if I wish to see new ones in the future, I would hope that if they do appear at some point, it would be in an improved fashion (still using the same system already developed however, because I think it is a solid one), as opposed to regressing. o.supreme wrote: It is nice to see these come out, but in a line where evolving to the next form really is not the theme, gets points taken away. I give PotP the win for Leaders. I don't understand this one. Evolving to the next form was not a line wide theme in POTP either, it only pertained to the leader class, making it ridiculously random. In Siege, its essentially the same thing, combining a smaller bot with extra armour BUT in this line its actually in theme with the rest of the line where those armour bits can be given to the other bots. From that perspective, the leaders to me, is the sure win for siege between both lines. Also, I found all the POTP leaders underwhelming, while the siege leaders all look good. The smaller voyager sized bot was really simplified in POTP while in Siege he looks more in line with the rest of the toyline. 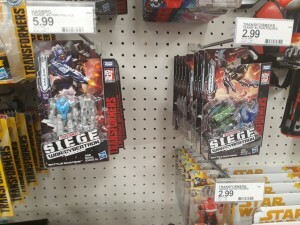 Nothing too exciting, other than i finally found the rest of Wave 2 of the Deluxe Siege line at a local Target, on the way to work. I had snagged Chromia almost two weeks ago but since then haven’t seen anything. Now they can just the rest at my office, lol! it never sank, there was always friction there. you seem to have the exact same toy as the rest of us do and not a running change. The point was that it didnt lock and was just held by friction. If your actually locked, like you couldnt press it more down, then that would be a running change.